The moment Anderson came to bat, one by one every Indian fielders went after him. First, Ashwin had a chat with the England’s last man, then Kohli engaged in a conversation. They were definitely not exchanging pleasantries. The payback time has arrived! It was Anderson who made Kohli his bunny during 2014 series where Indian skipper nicked down away going deliveries outside the off-stump. Virat has managed to play some of his best innings in the longer format of the game in this series against England. The Indian Test skipper has already scored 640 runs in seven innings at an insane average of 128.00, having severely punished the visitors. It’s payback time for Kohli! However, Anderson took a slight dig at Kohli by saying that Indian captain’s technical glitches, if any, aren’t visible because of the helpful Indian tracks which lack pace and movement. Things heated up after the English pacer ill mouthed against Kohli in a press conference. Ashwin was displeased with the comments made by Anderson on Virat Kohli’s batting at the end of the fourth day’s play. Ashwin took the banter on another level. The moment Anderson came to bat, one by one every Indian fielders went after him. First, Ashwin had a chat with the England’s last man, then Kohli engaged in a conversation. They were definitely not exchanging pleasantries. However, when asked about the incident, Kohli said: “For the first time, I was trying to calm things down in the middle at a time when James Anderson is involved. 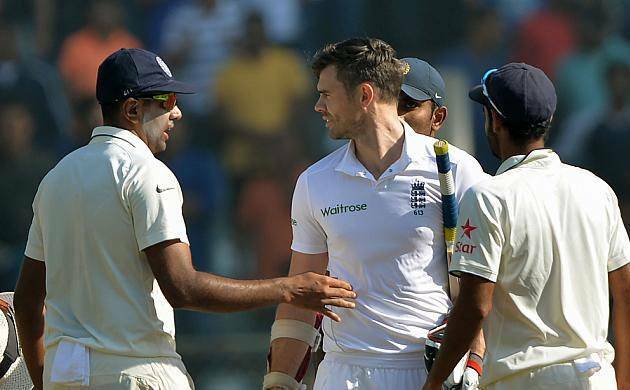 England’s captain Alastair Cook wasn’t too happy with the comments that Ashwin made on the field.